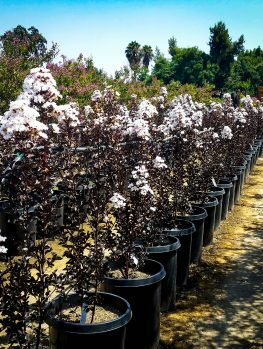 The Krauter Vesuvius Purple Leaf Plum tree is a fantastic small tree that brings vibrant summer-long color into your garden. Its leaves emerge bright red in spring, after a wonderful display of soft-pink flowers in late winter or early spring. As the foliage develops it turns deep purple-red, and holds that color all summer, even in hot areas where many other red-leaf plants turn green. It grows to between 15 and 20 feet tall, and it is an ideal small specimen tree to bring color to your garden for months and months. Plant a single tree on a lawn, or a small group in a larger space. Plant a row along your boundary, or an avenue along the driveway. This beautiful tree will always look just perfect. 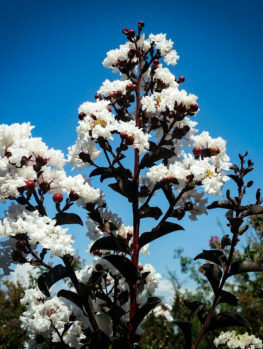 Plant the Krauter Vesuvius Purple Leaf Plum in full sun, to retain the maximum leaf color, and develop the most flowers. It will grow vigorously in any garden soil that is not constantly wet, and it has good resistance to drought once established. Growing well from zone 4 to zone 9, there is hardly a place in the country where this tree will not thrive. 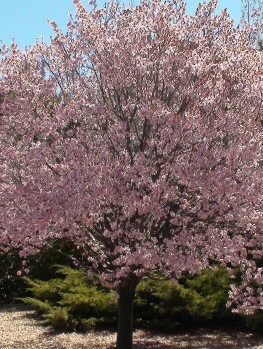 Regular pruning after the flowers fade will keep your tree bushy and dense, with vigorous shoots and strong leaf color. Foliage color is the modern way to garden, bringing color for months and months, instead of relying on a succession of flowering plants, each lasting just a few weeks. You can still grow flowers of course, but shrubs and trees with colored leaves bring a permanence and color structure that nothing else can. 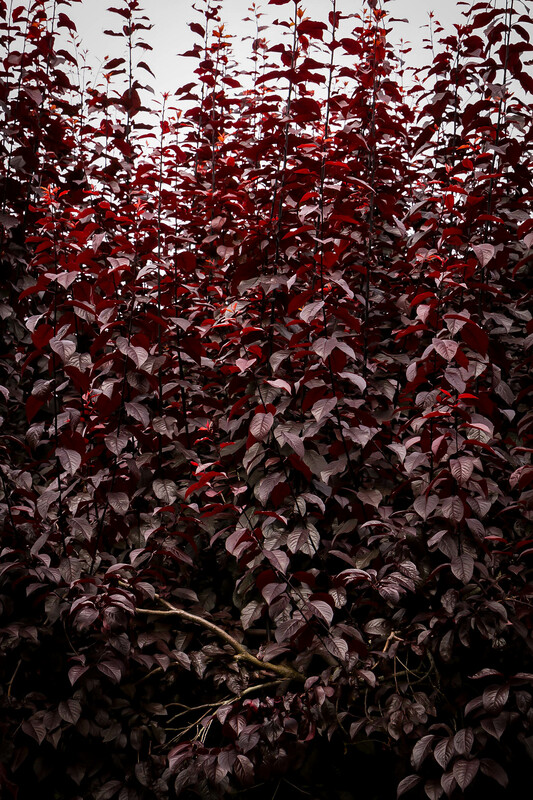 Perhaps the most popular color is red, which in plants is usually a dark, purplish shade. It can be found in many shrubs – Barberry for example – and small trees like Japanese Maples, but in larger trees it is rarer. In cooler regions the copper beech and red-leaf crab apples are popular, but in warmer areas the Purple Leaf Plum stands out, bringing rich purple-red leaves that hold their color all summer long. 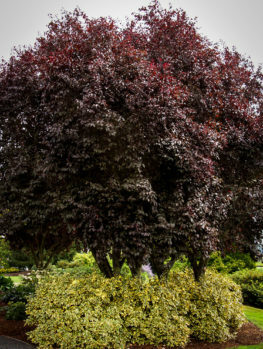 The Krauter Vesuvius Purple Leaf Plum, which brings the bonus of a profusion of spring flowers, and has vigorous, richly-colored leaves, is a top-choice form of this popular tree, and one you should choose. The Krauter Vesuvius Purple Leaf Plum is a small tree, reaching 15 to 20 feet tall and spreading about the same distance wide. It has a dense, upright crown of many branches, and in spring they are covered in a profuse blooming of small pale-pink flowers. The leaves are oval, up to 2 ½ inches long, with an edge like a tiny saw-blade, but not sharp. In spring they are a brilliant deep red, and as they mature they turn dark reddish-purple, holding that color all summer long, even in states with long, hot summers. 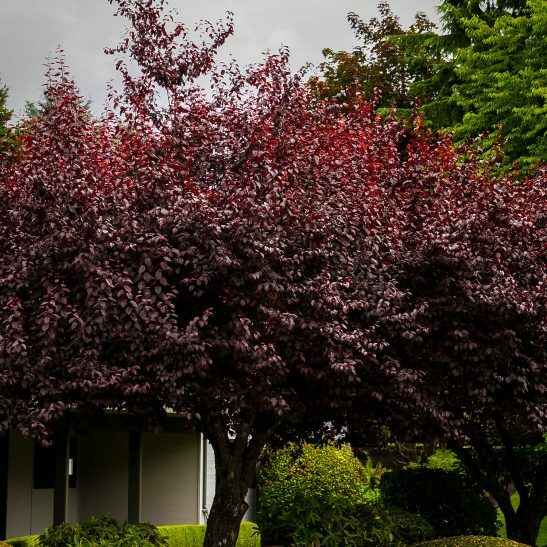 All of this makes the tree a much better choice than many other red-leaf small trees, such as most varieties of crab apple, which turn greenish in hot summers. Some summers this tree will produce small, edible plums, but far less than most other Purple Leaf Plums. This is a good thing, since the fruit can be messy when it drops, so don’t plant beside a paved area. With its rich foliage color, the Krauter Vesuvius Purple Leaf Plum is the perfect choice for making a bold landscape statement in your garden. Plant a pair on either side of an entrance. Plant a row spaced 15 to 20 feet apart along your property line, as a spectacular boundary, or along a driveway to create a majestic entrance. Planted closer together they make a solid summer screen. Plant a specimen in a lawn for a tree that won’t get too large, even in a smaller garden. 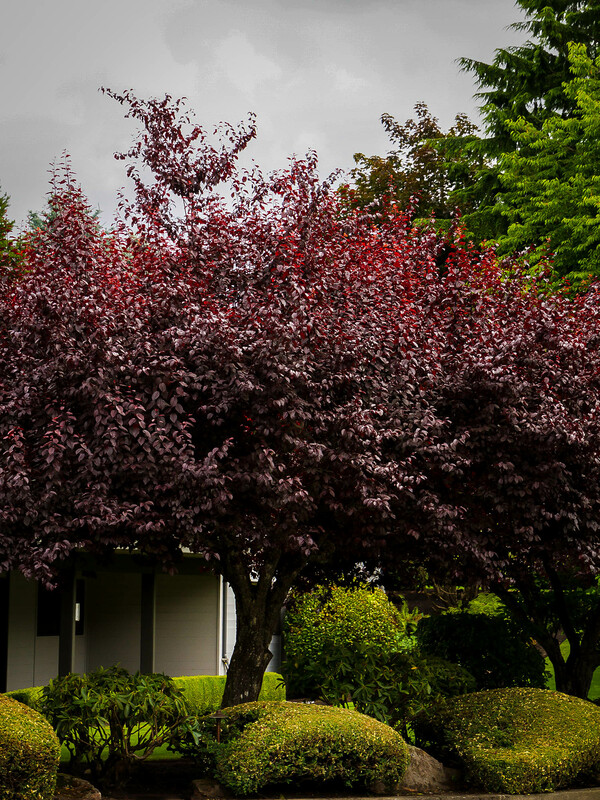 The deep, rich color of this tree looks best against a backdrop of green leaves, where the color really stands out. This tree blooms very early, and in milder areas you will see flowers during warm spells in late winter. The main blooming happens in very early spring, and the scented flowers crowd the bare branches, making a beautiful sight. 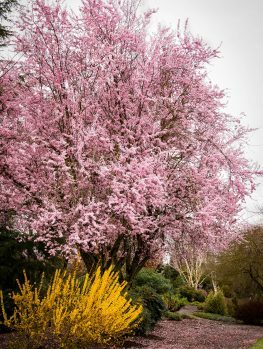 This dramatic display is a wonderful prelude for spring in your garden, and an added bonus to the value of this superb tree. The Krauter Vesuvius Purple Leaf Plum is easy to grow, and it should be planted in full sun, to keep that leaf color strong. In too much shade it can become greenish in summer, and flowering will be reduced too. It will grow well in any garden soil that is well-drained. Water your new tree regularly during the first year or two, so that it establishes a vigorous root system. After that, this tree is moderately resistant to drought, and it needs very little attention, so it’s perfect for the busy gardener. Mulch the roots in spring with rich organic material, or use a fertilizer for flowering trees, to keep your trees vigorous and healthy. Weak trees are more prone to disease and pests. You can allow your tree to grow naturally, but some regular pruning is recommended to keep it vigorous and bushy. Do this after the petals fall from the flowers and begin by removing weak or dead branches first. Then shorten the younger branches by one-third, to encourage bushy new growth. Keep a framework of older branches in the lower part of the tree. You can also cut back by about two-thirds if you have not been pruning regularly. Pruning causes strong vigorous shoots to develop, with large leaves that are vibrantly colored. If you prune hard, it may take a couple of years for full flowering to return to your tree. 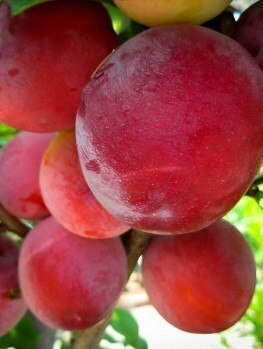 The cherry plum, or myrobalan, is the parent of the Krauter Vesuvius Purple Leaf Plum. 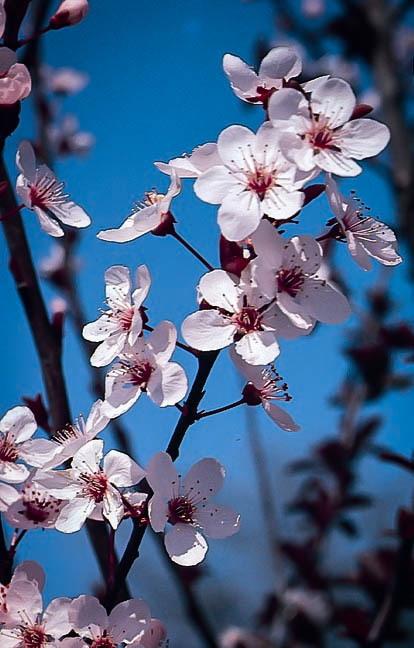 This green-leafed tree, called Prunus cerasifera, is not known in the wild, but seems to be an ancient large-fruiting selection of Prunus divaricata, a tree that grows wild in the Caucus Mountains, through Iran, and across central Asia. In 1880, a Frenchman, Monsieur Pissard, who was the head-gardener to the Shah of Iran, found a form of cherry plum which had pink flowers and deep red leaves. He sent plants to France, and from there it spread across Europe and to North America. His plant is called ‘Pissardii’. Several selections and improvements of the ‘Pissardii’ plant have been made over the years, and in 1957 Howard Krauter, whose father Karl owned Krauter Nursery in Bakersfield, California, found a branch on a tree of ‘Pissardii’ which remains deep red right into fall. He gave pieces to the L.E. Cooke nursery to grow some plants, they grew well, and were called ‘Krauter Vesuvius’, the best tree for stable red foliage all summer and into fall. 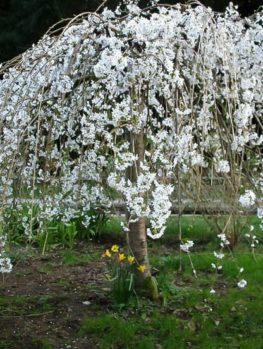 Our trees are skillfully produced by attaching sturdy stem pieces of the named variety onto selected forms of the green-leaf cherry plum. 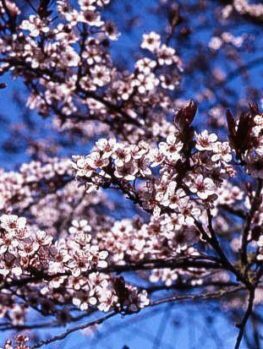 these develop into vigorous and hardy trees that will thrive in your garden. This ever-popular tree is always in high demand by gardeners looking for a bold specimen tree that is easy to grow. We will soon have no more stock – so order now.